CF faculty and staff please encourage students to attend Citrus Campus “Disney Winter Mania” Stressbusters on Wednesday, Dec. 5, from 12:15-1:45 p.m. in the Citrus Learning and Conference Center. 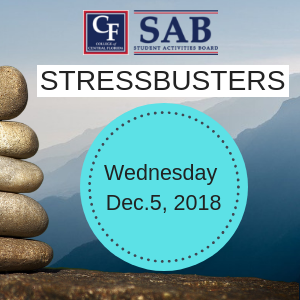 This event is a way to help students relieve stress before going into finals week. Activities include meet the mouse and an ice princess, balloon artist, ice cream bar, free food, photo booth and more!